T15 2-piece: Casting Word of Glory or Eternal Flame also grants you 40% (additive, not affected by DR) additional block chance for 5 sec/Holy Power. Buff duration is not additive. T15 4-piece: You gain 1 Holy Power for every 20% of your health taken as damage (after all mitigation, but counting absorbed damage) while Divine Protection is active. Today we’re going to look at how these bonuses will affect our play in 5.2. The 4-piece is interesting for a few reasons. First, it turns Divine Protection into a resource generator. While we have it up, we’ll be getting holy power in chunks whenever we take damage. Unfortunately, the amount of holy power is going to vary significantly based on the content you’re raiding. Heroic modes are going to grant more than normal modes, and 25-man raiders should see a higher benefit than 10-man raiders. It may very well be that the set bonus is highly prized by 25-man heroic guilds and nearly ignored by 10-man normal guilds. For 25H raiders, I wouldn’t be surprised if it turns Divine Purpose into another Holy Avenger, which would be an amazing boost to Shield of the Righteous uptime (though curiously, SotR being up diminishes the effect!). It also has the potential to shake up our rotation a bit since that extra holy power comes in discrete chunks, and at unpredictable times. You may normally be saving up 5 holy power before firing off SotR, but during Divine Protection you’d be at risk of wasting the holy power granted by the set bonus that way. It’s likely that during DP we’d shift to casting SotR at 3 holy power to prevent overages. Much like early iterations of uncapped Vengeance, basing the effect on post-mitigation damage might lead you to think that it encourages gearing for less mitigation. Except that in this case, you’re doing so to get more holy power and cast more SotRs, giving you more mitigation. It’s got an interesting built-in diminishing returns of sorts: as you take more damage, you get more holy power to feed into SotR to reduce that damage, lowering the holy power gain. So I’m doubtful that it’s advantageous to “tank without pants on” for the sake of the set bonus. However, it will generally generate more holy power for a control/haste gear strategy than for control/mastery or avoidance gear strategies. Remember that control/haste takes more damage than either of the other gear schemes, but that damage intake is smoother. That means more holy power generation, which is good, and potentially smoother holy power generation as well, which may mean less ends up wasted as overage. Another way it seems to affect itemization is to slightly disincentivize stamina since the effect is based off of percentage of health. For example, having a little less stamina may turn a 1-holy-power gain into a 2-holy-power gain, assuming the calculation is done per-attack instead of cumulatively. I don’t think this is enough to make Stamina any less attractive to the heroic-progression raider, because earning less holy power during Divine Protection is a lot more attractive than being dead. But stamina is already much less important to players farming normal modes, especially in the 10-man format, and this set bonus may further reward them for focusing on secondary stats instead of stam-stacking. One thing I can confidently state about the 4-piece bonus is that it will be more effective during high-damage periods than low-damage periods. Popping Divine Protection while you’re taking manageable damage will reduce your total damage taken, but won’t really make a meaningful impact on your survivability. Despite the natural diminishing returns effect, you’ll get more mileage out of this set bonus by lining Divine Protection up with high-risk periods. Because of this, I think the dev team’s concerns about this set bonus incentivizing Unbreakable Spirit aren’t going to be problematic in-game. Certainly making Divine Protection available 33%-50% more often makes the talent even more attractive than it already was. But I also don’t think that “spam Divine Protection on cooldown” will end up being the ideal way to use the ability. It may be the default choice on normal modes, or for players who really care about TDR (why?? ), but on heroic modes I’ve found that I’m often choosing Clemency instead. Aside: In fact, when Mel and I first saw Clemency announced at BlizzCon 2011, the first thing he remarked about was that it was so broken it would never make it live. I disagreed with him, of course (it’s just what we do). It turned out we were both right. The talent did make it live, and it’s just as broken (in a good way) as Mel predicted. Being able to double-BoP and double-HoSac is really good, to the point of breaking some encounters. Blade Lord Tayak is a great example – in a raid with 5 paladins, all talenting Clemency, the Wind Step mechanic becomes basically irrelevant. You have 10 Hands of Protection with which you eliminate the debuff before dangerous periods like Unseen Strike or Blade Tempest, and almost unlimited Hands of Sacrifice to cover everything else. The 2-piece bonus poses a quandary: is spending 3 holy power on WoG to gain 40% block chance for 15 seconds better or worse than using it for 3 seconds of SotR? That’s a tough question to answer because it depends on how you value WoG itself. Are we using it when we’re already at full health just for the sake of the 2-piece buff? That “100% overheal” estimate isn’t completely fair, because the heal certainly won’t always be overheal. On the other hand, assuming 0% overheal is just as unrealistic to the opposite extreme. Unfortunately, I think the true amount of overheal is likely to be closer to 100% than 0%. Your healers are playing a predictive game, queuing up heals 2 to 3 seconds before they actually land. Dropping an instant WoG during that process isn’t always useful. If their heal tops you off before the WoG lands, your WoG ends up being overheal. If your WoG lands first, all you’ve done is turn a chunk of their heal into overheal. It’s only when you’re low enough on health that all of the healing you take – your WoG, the healer’s long-cast-time heal, and any incidental healing from HoTs and such – that all of it ends up being effective healing. However, if we make some assumptions about WoG overheal, we can estimate the effect of this set bonus. I’ve modified my earlier Monte-Carlo simulation code (link) to handle the set bonus, which was relatively easy. The more difficult part was implementing WoG. Remember that we don’t track tank health in this simulation, just damage intake. Thus, I had to come up with another way to simulate the effect of WoG healing. The most straightforward analogy is an absorption bubble like Shield Barrier, since WoG essentially offsets part of a boss attack. However, I’ve kept the duration short in order to make sure we can’t “save up” WoG absorption to apply to a spike too far down the line. My approximation here is to give the fake WoG bubble a 3-second duration. That way it’s an effective counter to a boss attack in close proximity to the cast, but ends up wasted if we avoid the next two attacks. The default rotation we’ve been using in earlier simulations is just spamming Shield of the Righteous as much as possible, so that will be our gold standard. We’ll call that rotation “S” for simplicity. We could also imagine ignoring SotR entirely and spamming WoG with all of our Holy Power. That rotation, which we’ll call “T” for “tier bonus,” will use WoG any time the tier bonus buff drops off, as well as if we hit 5 holy power so that we don’t waste anything. The simulation tracks BoG stacks appropriately, of course, so we can also evaluate rotations that mix SotR and WoG much the same way that we looked at combinations of Shield Block and Shield Barrier in the warrior simulations (link). There are two logical ways I could come up with to do that. The first is to keep the tier bonus up at all times and use SotR as a bleed mechanism rather than WoG. The way we’ll do that is to cast WoG every time the tier buff drops off and only cast SotR when we’re at 5 holy power. We’ll call that rotation “TS” to indicate that it prioritizes the tier buff over SotR. You might ask why we’re not considering alternating queues, like “SotR-WoG-SotR-WoG.” The problem with those sorts of queues is that holy power generation isn’t steady. During the 5-second duration of a 1-holy-power tier buff, we could get anywhere from 2-4 holy power. As a result, those rotations are going to be very inefficient. They’re either going to overlap SotR and the tier buff and have gaps in the coverage of both, or they’re going to end up refreshing an existing tier buff early, which is wasteful since the duration isn’t additive. The TS and ST rotations employ logic that avoids these problems, and as a result should be more efficient than any fixed cast sequence. First, let’s take the most pessimistic view of WoG and assume that it performs 100% overhealing. That means WoG is doing nothing but applying the tier buff. This is the “worst-case” situation for the tier bonus, of course, but if it beats SotR spam in this simulation, it will be the unquestionably better choice. So, those numbers are a pretty strong indication that the tier bonus isn’t worth giving up SotR for. The T rotation takes significantly more damage than the S rotation, and performs worse in every spike category, in many cases by huge amounts. The closest it ever comes is a factor of 2x worse, but it’s up to 50x worse in some categories, and that’s not counting the situations where SotR eliminates spike representation (because you can’t divide by zero). Maybe this rotation will improve with some of WoG’s power restored to it, but it’s got a long way to go to catch up. The TS and ST rotations don’t perform much better. They’re both worse for 2-attack strings, though they manage to do about as well as S in in the 3-attack category. However, they quickly fall behind for 4+ attacks. There’s just really no comparison here in which they shine compared to SotR spam. Spending any holy power on WoG for the sake of the buff seems counter-productive if you’re not getting anything out of WoG. Damage intake profile for the “S” (SotR spam) rotation. Damage intake profile for the “T” (WoG spam) rotation. As the statistics suggested, this doesn’t do anything interesting for us. It doesn’t push the mean down, unlike Shield Barrier does in the warrior simulations. It also doesn’t do much to eliminate spikes, as the representation of 80% and 90% spikes is still very large. It just doesn’t do much of anything. Damage intake profile for the “TS” rotation. Damage intake profile for the “ST” rotation. Both ST and TS look pretty similar here. 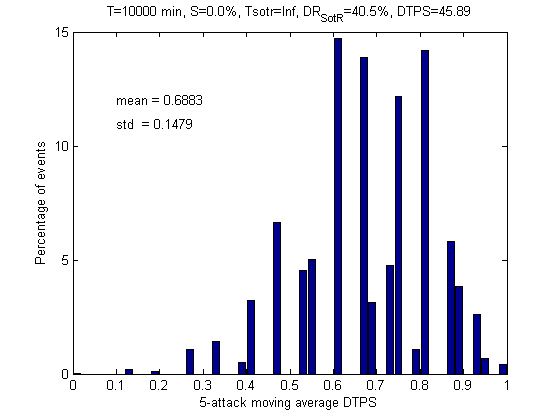 ST is a little better at spike elimination because it prioritizes SotR more highly. But the interesting part is how much different they are from the SotR spam rotation. Instead of a scattered distribution, we’re getting something that has a strong resemblance to a bell curve. That’s primarily due to the extra 40% block being up so often. 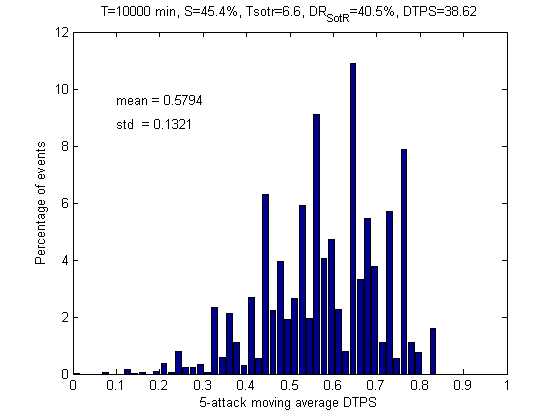 The significant increase in block chance creates a larger variation in the size of 5-attack strings because we’re far more likely to get multiple blocks mixed in with our avoids and SotR events. It’s sort of a central limit theorem thing happening. Anyway, so far there seems to be no significant advantage to prioritizing WoG for the set bonus at all. However, that was also the worst case. Let’s be more generous and assume that only half of WoG’s healing ends up being overheal. How does that change the results? Aha. Now we’re starting to get somewhere. First, we see that even the T rotation has pulled ahead in TDR at this point. It still trails in most of the relevant spike metrics, but not all of them anymore. TS still doesn’t look that attractive, but ST now seems to really compete with S. It tends to permit more 90% spikes while reducing the 80% spike numbers significantly. I think you could make good arguments for both S and ST based on these numbers. Unfortunately, I also think this situations is pretty unrealistic. It’s basically impossible to operate in the no-overhealing limit in a real raid environment. Your World of Logs reports will probably tell you that your actual healers are doing at least 30% overhealing when you’re not using WoG. Chances are your own overhealing is much smaller if you’re saving WoG for low-health situations, but it’s probably still non-zero just due to cases when your healers react to your low health the same way you do and heal-bomb you. If you’re using WoG more regularly, especially to maintain a buff, it’s likely to push both of those numbers up. I wouldn’t be surprised if the 50% overheal data is a far more accurate estimate of what we’ll see in-game than either of the extremes. And if that’s the case, the strategy of treating the tier bonus as a maintenance buff just doesn’t seem compelling. It may be a nice temporary mitigation boost for cases where we might use WoG anyway (i.e. low health, high BoG stacks). But it’s not going to be game-changing. The short short version is: 4-piece is good, and probably worth getting. But the 2-piece is probably at best a “meh.” It lowers the opportunity cost of having to use WoG, which is probably good because SotR is such a huge amount of mitigation to give up. If the two were reversed, such that “WoG-block” were the 4-piece, we would probably all skip it. Since we’re likely to want the Divine Purpose 4-piece though, we’ll get WoG-block whether we like it or not. In any event, don’t plan on changing up your rotation based on the 2-piece bonus – just stick with your usual “Spam SotR and WoG like a fiend if I’m about to die” and you’ll be playing optimally. The 2-piece bonus just makes those situations where you need to WoG to survive the next attack feel a little less punitive. This entry was posted in Tanking, Theck's Pounding Headaches, Theorycrafting, Uncategorized and tagged Active Mitigation, blocking, buffs, diminishing returns, Min/Max, raiding, rotations, tank, tanking, theck, Theorycraft, theorycrafting, warcraft, WoW. Bookmark the permalink. How would these metrics change if you used the control/mastery build – going off GCs comments that they want to reduce the value of haste for prot paladins, that would perhaps be a better test setup- prioritizing mastery in the build would suggest to me that the 40% block becomes more valuable as it gets the total block closer to eliminating hits (though that may be my lack of sleep talking). I can test it, but I don’t think it will make a significant difference. We only have 4000 haste, which is ~7% mastery before DR (and less after). The benefit of +40% block isn’t going to change dramatically going from ~60% to ~67%. Also remember that mastery buffs SotR as much, if not more, than it will the block buff. Losing the HP gen from haste will probably mostly affect bleed valves. Would this change over time when ilvls rise and we get more and more secondary stat points to play with? Since I’m not raiding HC, I’m not gearing for stamina as much and running around with 7500 haste rating and 4000 mastery rating (we have only 1 plate dps in our guild, which does help me pick up haste ‘tanking’ gear). This will only grow as we move from Tier 14 to Tier 15. As a non-HC raider like Thels (with similar haste, but he has much more mastery), I too do not value stamina much due to never getting close to death. Additionally, both of these set bonuses seem very uncompelling. I do like the ret 5.0/5.1 set bonuses & reserved for 5.2 new ret set bonuses. Currently I am much, much more concerned with the devaluation of haste for prot-pallies. While it does make it unusual to gear, I really like this unique style. It also helps build my ret set due to dual-purpose gear. I feel that if it’s devalued much it will #1 – Lower survivability for 5.2 transition, #2 – (Variably) Invalidate much of my gear, #3 – Decrease Prot-Pally damage (& self heals, which leads to #1). I’d rather the developers/designers just leave it status-quo. I understand they didn’t intend this to happen, but it does feel more ‘fun’ to gear for hit/exp hard cap then next with haste/mastery. Hopefully you are correct and the devaluation isn’t really significant and hit/exp/haste/mastery is still the way to go. I’m reading this as block chance will go up 40%, 80%, 120% with 1/2/3 HP while remaining at a 5s duration. Or does it mean that casting WoG while the 2pc buff is already up will only refresh the duration and not add 15s to whatever you have left (assuming 3hp cast). I can see the confusion on the way it’s worded, but a blue post clarifying their intentions specified that it was 5 seconds per holy power, but the 40% was a flat amount. So in this case, only the duration will scale with the holy power you apply to WoG. I’m contemplating the 2pc more as an additional smoother personally. It feels situational rather than rotational. Take a dragon breath situation: you pool to 5HoPow then SotR to smooth the melee immediately following the breath, then CS->3pt WoG to top back up and continue to smooth after the SotR ends. Similarly, rather than doing 2x SotR in a row if you dip to 50% hp you could 1x SotR & 1x WoG. In a 10 man environment, the overheal is likely to be very minimal with that usage & it’s likely to stop your healers having to waste an additional GCD topping the tank up. For example when I look at my WoG overheal – which admittedly excludes healer overheal caused by WoG – I had ~36% on our progression H-Spirit Kings kill, ~20% overheal through all H-SK attempts & ~11% overheal on a full clear of normal HoF. The downside is if you start using WoG that regularly, you’re giving up sitting on 5 stacked Bastion as an emergency CD. So from my perspective, that’s the real conundrum. Do we know how high the item level, and therefore the total amount of stats, and therefore the maximum amount of mastery reachable gets with heroic uber thunderforged leet elite t15 gear? As in, how close can you get to block capping when you devote everything to mastery and add the 2pc? We’re not going to get there in T15 at least. You need over 32k mastery to block cap. See the post of mine that Thels quoted below. Is Block Chance affected by DR? MT is down. EJ seems to say not, but the post is outdated. If Block Chance is not affected by DR, then we meed 104.5% block chance. Since the set bonus gives 40%, we need 64.5% block chance. At 600 rating per 1%, that’s 38700 rating. We get 3000 rating from BoM and can get 530 rating from enchants, so we’d need 35170 rating. That seems quite a bit. If you’d divide it by 16, we’d need 2198 mastery rating per equipped item. That seems far from likely to happen. 104.5% is how much block you need to cover the combat table. Remember that Mists increased the level-based reduction in miss, dodge, parry, and block to 1.5% per level. So a level 93 boss gives you -4.5% miss, -4.5% parry, -4.5% dodge, and -4.5% block. Since block is on a second roll, we need 104.5% to achieve 100% block. 13% of that is guaranteed from base block and spec (3% base, 10% spec, neither are subject to DR). I’ve obviously also assumed that the 40% from the set bonus is not subject to DR. Everything else should be though. That leaves 51.5% block that we need to make up from sources that are subject to DR. That’s equivalent to 69.39% block before DR is applied, and I’m assuming it all comes from mastery. The “free” 8% is the 8% mastery you get baseline at level 80 when you learn your mastery skill. The other 61.39% has to come from mastery rating. 61.39% mastery is 36834 rating from all sources. If you want to account for BoM, elixir, and food, subtract your 3950 from that to get 32884 rating from gear and enchants. Hello Theck, could you test this with different T5 (?) talents? I think in combination with Divine Purpose a rotation, which allows 1HoPo WoG for the Buff, might give quite high TDR and maybe better smoothing (even though I feel it’s probably worse for smoothing than pure SotR). With DP a 1HoPo WoG, which proccs DP, would give 8 seconds of something up (5 for T15 + 3 for the free SotR). I don’t have the talents coded in this simulation. That said, Thels pretty much addressed why this wouldn’t be particularly attractive. In addition, it would be stochastic, so there would be periods where you’re swimming in DP procs (and end up wasting potential coverage) and periods where you’d be more vulnerable. The reliable ~30 seconds of complete Holy Avenger coverage every 2 minutes should trounce DP in smoothness statistics. The problem is that we can’t choose to use 1HoPo WoGs. It’s already custom to gather up to 5 HoPo before using SotR, so you’re not going below 2 HoPo unless you need the SotR or WoG (in which case you either have 3+ HoPo available, or it’s only 1 generator away). This would require using SotR at 4 HoPo, and then not to use any generators until you use WoG. It would seriously kill our options for an on demand SotR or WoG. Interesting. Thanks for doing this Theck. A WoG/2P driven rotation will, it occurs to me, likely always been inferior to a ShoR-driven rotation for 4+ swing spikes because of their structures. The ShoR system is pretty stable and with normal raid buffs and boss swing-timer, never go more than 4 boss swings without having a ShoR up. So its simply impossible to take 5 unmitigated swings in a row and it wouldn’t be especially common for there to even be a chance of taking 4 in a row. However, if you put any HoPo at all into keeping up the 2p buff, you increase the gap between ShoR up-times. This extends the window during which you can take unmitigated hits, and while its unlikely, it becomes possible to get hit 5 or 6 or more times. The advantage, if it exists, would come in the form of superior performance against 2 or 3 swing series. With 2p/WoG, you’ll have *more* of these series to deal with than with ShoR, but you’d also have +40% block. The numbers appear to be saying that the increased number of 2 and 3 swing series you have to face between SHoR up-times overwhelms the improved block%. I’m curious about a couple things. First, does EF instead of WoG change the numbers much? Second, would EF even be worth using over SS? What’s the opportunity cost with using EF instead of SS, if there is one? There essentially is no opportunity cost of using SS in terms of survivability. That’s why SS is the de-facto talent in that tier for us. SS costs you DPS in the form of a GCD here and there. EF costs you holy power and SotR uptime. Even with the buff coming to EF in 5.2, it will be the inferior choice. At least it will finally do more total healing than SS grants absorption, though. It was just silly that EF healed for less given that absorbs are hands-down better. In the context of this simulation, it’s irrelevant anyway. EF doesn’t change the base heal size, and the HoT suffers from overheal while SS does not. My main thought was that the HoT wouldn’t suffer as much from overheals as WoG, but given that this is for burst the HoT probably wouldn’t help much in that regard now that I think about it. Actually, I’d argue the opposite – the HoT is far more affected by overheal. Your healers are going to top you off after a spike, so the long tail of the EF HoT will almost always turn into a significant amount of overheal. Think about it this way, do you regularly sit at 30-40% health for 30 seconds? Of course not, your healers are constantly trying to bring you back up to 95%+ health. So a lot of those ticks are going to happen while you’re sitting at 100% health. At least with WoG, you can time your cast for a moment when you’re at 30% health. Thanks for all your work on behalf of us Prot Pallies. It seems to me that the 2pc could be quite handy when used pro-actively, particularly but not solely in conjunction with HA, as you can guarantee both the SotR buff and the block buff up at the same time in advance of an expected big hit. My question I guess is does the fact that boss ‘cooldown’ attacks are predictable, and that not every swing is equally dangerous, influence your conclusions? Not especially. Sure, you could put SotR and the 40% block buff up for a given attack, but.. why would you bother? SotR is generally enough mitigation to make any attack “safe,” so there’s not much point in doubling up. The principle of “minimum sufficient mitigation” applies here. Since you’re already guaranteed to survive if you have SotR active, it’s more useful to save that holy power and use it on more SotRs. Not coincidentally, this is why we prefer haste over mastery. SotR is enough to make a melee attack irrelevant already, so it’s less important to increase mitigation during an already-high-mitigation phase (via mastery) than it is to simply have more of those high-mitigation phases (via haste). Thanks Theck for you great work once again. Just a shame that these are another set of crap bonuses for pally tanks from bliz again. I wouldn’t call them crap. They both seem interesting. A lot more interesting than cutting a minute of Ardent Defender. The 2 set bonus is clearly subpar when being used pro-actively. It’s just better to keep SotR up, than the set bonus. However, we do use WoG from time to time as an emergency heal, which currently then leaves us completely defenseless. With the set bonus, you at least have a decent chance to live though it. The 4 set bonus is simply flat out extra HP, thus extra damage and survivability. I fail to see how that’s crap. One thing hit me, though. We’re currently considering a single boss attacking us. What if we’re tanking a bunch of adds? If we have 4-8 adds attacking us, would SotR still win? SotR would apply to ALL attacks for 3 seconds, and then NONE of the attacks a few seconds, and then ALL attacks again. The Set Bonus on the other hand can be kept up all the time, so every couple of seconds, SOME of the attacks are blocked, which feels better than ALL and NONE. I agree that they feel kind of crappy, but the 4pc actually feels worse to me than the 2pc. The 2pc will help us catch back up with the damage intake when we spike. Heroic Will is an example of where I think the 2pc would be really nice. There are about two or three times in the fight where Holy Avenger is down, GoAK is down, I’ve used my externals (or more likely the other Healers are OOR), I get knocked down really low, and then top myself off with a WoG (2pt WoG for 496k last night) but am worried about getting immediately trucked back down due to not having SotR up. Would be nice to have 40% extra block right there. However, the 4pc just seems weird. I’m getting HoPo when I need it the least – when a cooldown is up. It being post-mitgation boggles the mind a little bit as well. I do wonder how it will interact with Spirit Link Totem though. While I think your method of determining value here is pretty sound. The pally tank in my raid is already using wog every hp over sotr along with glyph of the battle healer and he uses sotr on dp Procs or during times of high damage. I know most pally can get pretty high uptime on sotr but he is stacking haste>mastery and getting like 37% sotr (he says). I can tell you he’s not far behind as 4th in heals. So with the bonus I see his play style actually making it easier on him with the 2pc. I guess my question is this, sure he wont perform as well without heals but is that possibly offset by the fact he is effectively aanother raid healer and our healers can focus better on the spike damage as he is bringing steady heals? I’m always a little skeptical of this “tank as an extra raid healer” theory. Sure, he might put out a lot of healing via WoG, but he’s probably sniping heals from the other two/three healers, and simultaneously increasing the healing load on his own healers. Plus I have no idea how anybody can manage to efficiently heal the group on grid while paying attention to all of the other encounter-specific things a tank generally has to watch. My suspicion is that while they may do a lot of healing, they’re also using their active mitigation very sloppily, further decreasing their survivability. For instance. I did 3.3 million healing, only 26% of which was overhealing, on our kill. (we are a more than a bit behind, but I’m trying to make sure I can decide which to use in the future.) Most of this was on me, which allowed my healers, who are a bit behind on gear, to ignore me for the most part and pay attention to the raid. I used a TS priority, but didn’t succeed in keeping full uptime on T, which would have caused more overhealing, but taken less damage. I’m just not sure, looking at fights where there aren’t “triple punctures” or “Snapping bites” to worry about. Sure, a fight where a large portion of your intake (>50%) is magical damage would be a special case where WoG would be attractive. Lei Shi is another such fight (taken to an extreme). Though again, I don’t think you’re so much keeping up a TS rotation at that point. Your focus isn’t keeping the tier bonus up, it’s using the right active mitigation ability at the right time (WoG immediately after breaths or during heavy DoT damage, SotR during melee periods). Thank you for your reply, Theck. That really helped me, as I was having trouble figuring out if I had done the wrong thing, and just gotten through due to healer compensation, or if I was doing the right thing on that fight. What do you feel about using TS on large amounts of adds? For instance tanking the Bats on Tortos? I generally use a WoG for the aoe healing aggro with 3 HP and then use SoTR after they are gathered. 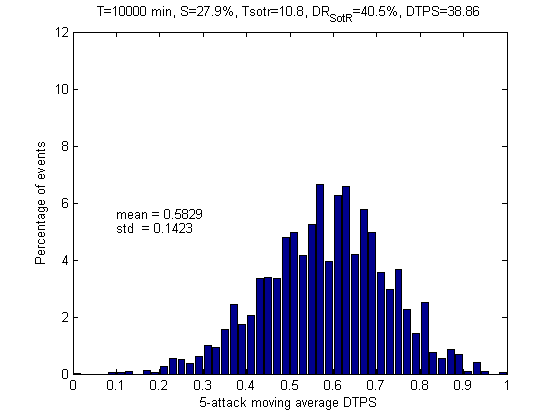 It seems like, with multiple adds, and the resulting quick succession of hits, that the ~70% block chance for 20 seconds would be better to prevent spikes than the more partial coverage that SoTR offers. Of course one WoG at the beginning of the bats is generally enough for the Tier bonus to be kept up until that wave is killed. In AoE situations I think the 2-piece really shines, especially since you can put it up before you start tanking and still use SotRs during.